I'm working on getting my thoughts, goals and plans in order for the New Year (or at least this week), and will be sharing my ideas soon. 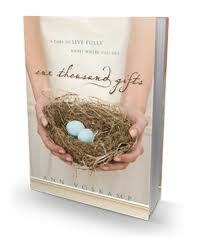 In the meantime, I have started reading Ann Voskamp's One Thousand Gifts: A Dare to Live Fully Right Where You Are. I have also printed out her January Joy Dare to follow along this month (and this year, as the printables are available). I do not know why I didn't do this before. If you have not read Ann's book yet, I highly recommend it. I am only into the second chapter (how exactly do you find the time to read and care for home and kids, by the way? ), and it truly is amazing. Perfect for those of us moms who don't feel like homemaking is a "comfortable" fit. Perfect for those of us that often feel the need to do something more than we are doing, something more important, outside of our home. 1. A "Happy New Year" and a midnight kiss. 2. The whisper of my baby girl saying "Mama, I love you" just before she closes her eyes and falls to sleep. 3. Baby gibberish from my happy 4 1/2 month old. 5. Clean floors that are ready for more play (we have hardwood floors, they are rarely clean). 6. Homemade mini pizzas to ensure everyone is happy with the toppings. P.S. My best gift in 2012 was the birth of my third baby! I married a wonderful man 7 1/2 years ago who never considered getting married or having kids before then, and now after 2 miscarriages we have been blessed with 3 beautiful babies in the past 4 years (ok, at 4 the oldest is entering "kid" territory, but still, he's my baby!). Truly a gift. What was your best gift of 2012?